There are thousands of fast food restaurants throughout the United States that offer some form of free Wi-Fi Internet access to the public such as Burger King, McDonalds, Subway, Taco Bell and many more. Get online for no charge (if you do not mind getting some grease on your keyboard) at these free wifi hotspots. Below is a list of popular fast food restaurants that are currently offering free Wi-Fi. Do you know more restaurants with free wireless? 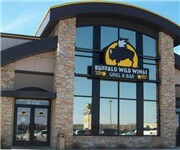 Buffalo Wild Wings Grill & Bar - Enjoy free wifi while you eat, all Buffalo Wild Wings offer free wireless. Buffalo Wild Wings Grill & Bar is restaurant chain that is a NY-style wing joint with 14 signature sauces. They are also a sports bar, complete with a full menu featuring everything from salads to appetizers to burgers, and a variety of specialty items. Burger King - While not all Burger Kings offer free WiFi, some do. Cici's Pizza - Yup, all Cici's Pizza provide customers with free WiFi internet! You gotta go to CiCi's Pizza, the endless buffet of fresh salads, savory pasta, delicious desserts and fresh-from-the-oven pizzas. Our dough is made from scratch everyday, our sauce is a blend of vine-ripened tomatoes and spices, our signature salads are hand tossed with the freshest ingredients and our desserts are simply delicious. Plus, guests under the age of 3 can enjoy the entire buffet for free. Denny's - The Denny's Wireless Internet network brings bring free wireless Internet access to all Denny's fast food restaurants across the USA and Canada. "We've had Denny's Wireless Internet in our restaurant for close to two years and our customers love it," said Joe Terrell, board member of the Denny's Franchisee Association. "Now that we're offering it free, usage is growing by leaps and bounds which adds to my top and bottom line." Dunkin' Donuts - Since Dunkin' Donuts is a franchise brand not all places offer wifi in the stores. However many Dunkin' Donuts do provide customers free wifi access in the store! Jack In The Box - Did you know Jack In The Box is outfitting their restaurants with Free Wi-Fi? They are doing it quietly as part of their remodeling plan, and so far it’s included stores in California and Arizona. Jack in the Box is remodeling its restaurants and each so-called "re-imaged" location is outfitted with free Wi-Fi. Jack in the Box acknowledges the free Wi-Fi but says it's "premature to talk it about at this time." Look for "jackwifi" stickers. Krispy Kreme - Krispy Kreme in the US and the UK launched a free in-store WiFi for those customers looking for an office or home-from-home on-the-go. The free WiFi service, delivered by The Cloud*, will allow Krispy Kreme customers to access the internet using any WiFi enabled device during their time in-store. Giving customers the chance to escape their day-to-day office or home space and experience a sweet treat while they work or surf the web. Krystal Burgers - Krystal is one of the growing number of fast food restaurant chains offering free wireless internet access to customers with Wi-Fi compatible devices. Known as "The Krystal HotSpot", the service is nearly universally available at Krystal locations offering inside seating. 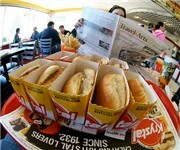 Krystal is an American fast food restaurant chain known for small, square hamburgers, and unique breakfast food items like the "Scrambler" - a mixture of eggs, sausage, and other items such as pancakes or grits. McDonald's - In mid-January 2010, McDonald's restaurants became one of the nation's largest providers of free Wi-Fi Internet access. Free Internet access is available at 11,000 of the 13,000 U.S. locations. "Free" means what it says and no purchase is required. Schlotzsky's - As the Schlotzsky's chain has expanded to 40 company-owned and franchise stores mostly in the South that offer in-store free computer access and Wi-Fi, their latest market research shows a significant uptick in awareness. Schlotzsky's reported that 40 percent of customers surveyed considered Wi-Fi and computer access a factor in their decision to come to Schlotzsky's, while 6 percent said Wi-Fi access alone was why they were there. Subway Sandwiches & Salads - Subway is one of the many fast food restaurants slowly bringing online some of their many stores with free wifi. Although only a small percentage of the more then 30 thousand Subway locations currently offer free wireless to customer, a growing number are providing this service. Taco Bell - Like some of the other fast food restaurants rolling out free wifi to customers, Taco Bell in some locations has begin a small release of free WiFi called TacoBellWiFi. Although still in a prototype phase look for free wifi coming to a Taco Bell restaurant near you soon. Quiznos - Some Quiznos locations now are offering complimentary wireless high speed internet to their customers. Like many of the other fast food restaurants that are franchised not all spots are hotspots, however many locations are providing free wireless to customers. Wendy's - Wireless network management system provider AirWave Wireless has a new alliance with equipment provider Juniper Networks, and the first major customer they're announcing is the Wendy's restaurant chain. The maker of square-burgers-on-round-buns has 6,600 locations around the world, mostly in North America. Each Wendy's location will be equipped with WiFi for their customers for free in the next year or so although many are up and running already. General Info about WiFi at McDonald’s (payed and free) - "We believe in bringing you innovative and convenient services that enhance your McDonald's restaurant visit, and Wi-Fi is a perfect example. As McDonald's continues to deliver fast and friendly food service at more than 30,000 convenient locations around the world, you can now enjoy the possibility of staying connected with friends, family and co-workers. Just find a Wi-Fi ready restaurant (click here for Wi-Fi enabled locations in your area) and you can check e-mail or chat with your friends while your kids are having fun in the Playplace. To access the Wi-Fi services in a restaurant, you need a Wi-Fi enabled device, such as a laptop or PDA. Our local service providers provide high-quality Wi-Fi service through several convenient connection options: on-line credit card payment, subscriptions, prepaid cards, or (sometimes) promotional coupons. If you have questions or need technical help, the Wi-Fi provider's customer support number should be handy in the restaurant. Please note that currently there are no roaming capabilities between different countries, neither for customers nor McDonald's employees. You will have to connect separately with the respective Wi-Fi service provider." For more information see www.mcdonalds.com/wireless/find_hotspot.html. Free Wi-Fi: Should Retailers Offer It to Customers?